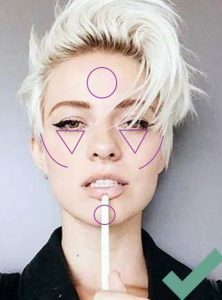 The perfect face shape is oval, and if your face is somewhat round or rectangular, your aim is to make it become as close to oval as possible. 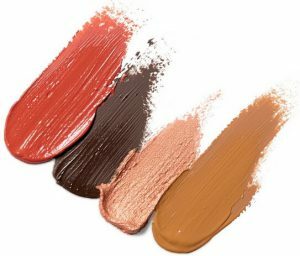 And darker and lighter shades of the cosmetics you pick for contouring will help you do that. By contouring we mean application of darker products, and by highlighting we understand applying light products. 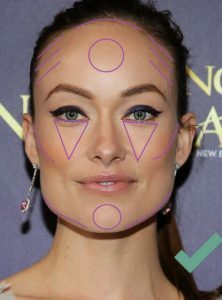 So, here is how contouring works for different face shapes. Work with dark product first. 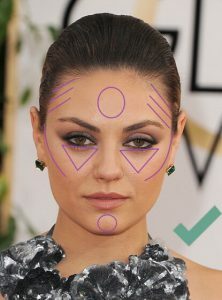 Contour below your cheek bones. Start from the top of your ears and go somewhat horizontally to the middle of your cheeks. Those horizontal lines will make the face more horizontally challenged. Now it’s time to work on highlighting. First, work on brightening your eyes. To do that, you need to draw upside down triangles under your eyes with the light contouring product and gently blend the edges. Next, apply light line along your eye brow line. To broaden your forehead and chin, which are naturally narrow, you need to apply light product in the middle of your forehead and in the middle of your chin. When the width of the hairline is about the same, as the width of the jaw line and the face is longer, than it is wide, the face is considered rectangular. And by means of contouring such shape can look like it’s oval. And here’s what you want to do. First you want to apply dark contouring product on the sides of forehead to make it appear narrower. By applying contour along your hairline, it will appear lower. Then, apply contour under the jawbone to make it look narrower. 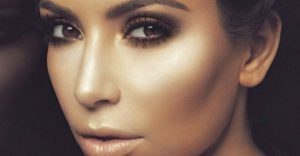 After that, apply contour below the cheek bones starting from the ears to the middle of the cheeks. Light product should be applied in the middle of the chin and under eyes. When the face is round, you will need to apply contouring products to make the face appear longer. This will make the face appear more oval, and that’s exactly what we want. Contour on the sides of forehead, as well as along the temples to make these areas appear narrower. Apply contour under the cheek bones starting from the ears to the middle of the cheeks. To brighten eyes, apply light product in an upside-down triangle shape to prolong the face and brighten the eyes. Apply highlighter in the middle of your chin and in the middle of your chin. 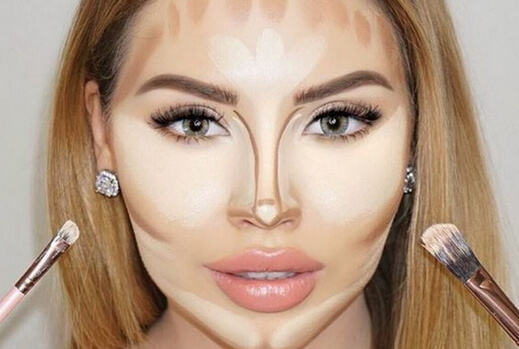 We’ve just covered the basics, and now you know where to apply contouring products. Now, here is a couple of easy tips that will explain you how to do that for perfectly contoured face. If you contour your face with creamy products, it’s better to apply primer first, than do contouring, and only then apply foundation. If you do contouring with powder products, you will need to apply foundation and powder first and only then do contouring. When powder contouring products are applied directly to foundation (with no powder over it) contours will be hard to blend. For that perfectly contoured and glowing look, you can apply highlighter with finely milled shiny particles for more shaped face. It is a good idea to do contouring with creamy products first, then apply your foundation and powder and then add extra depth to your contouring by means of powder contouring. It is important to pick the contouring products in accordance with the natural skin color for natural look. That's my favourite kit that helps me contour my cheekbones and nose. I like the way it blends and its awesome pigmentation!